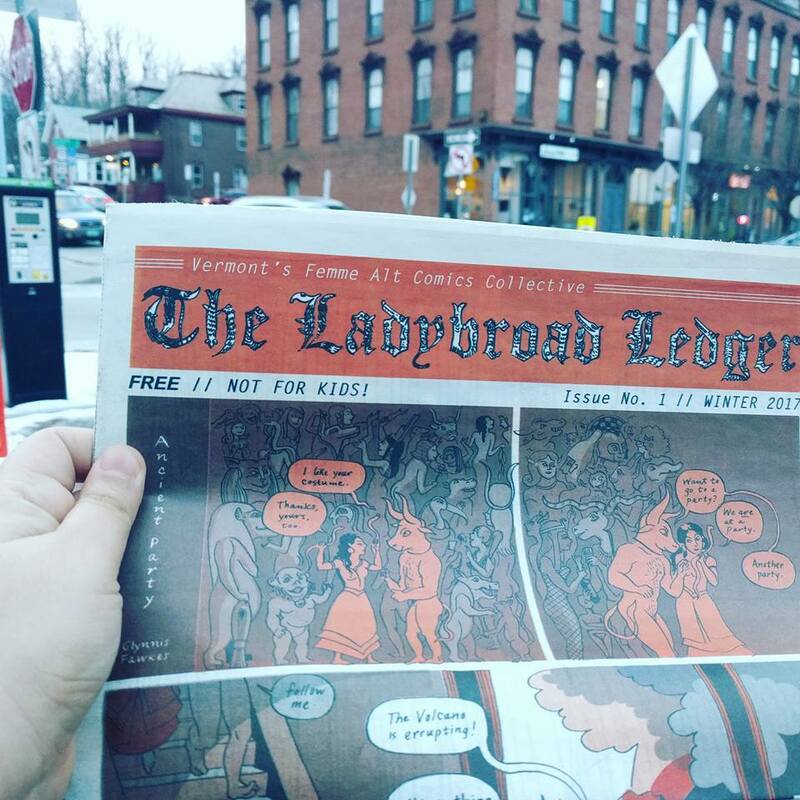 The Ladybroad Ledger is creating Vermont's only FREE femme alt-comics newspaper! 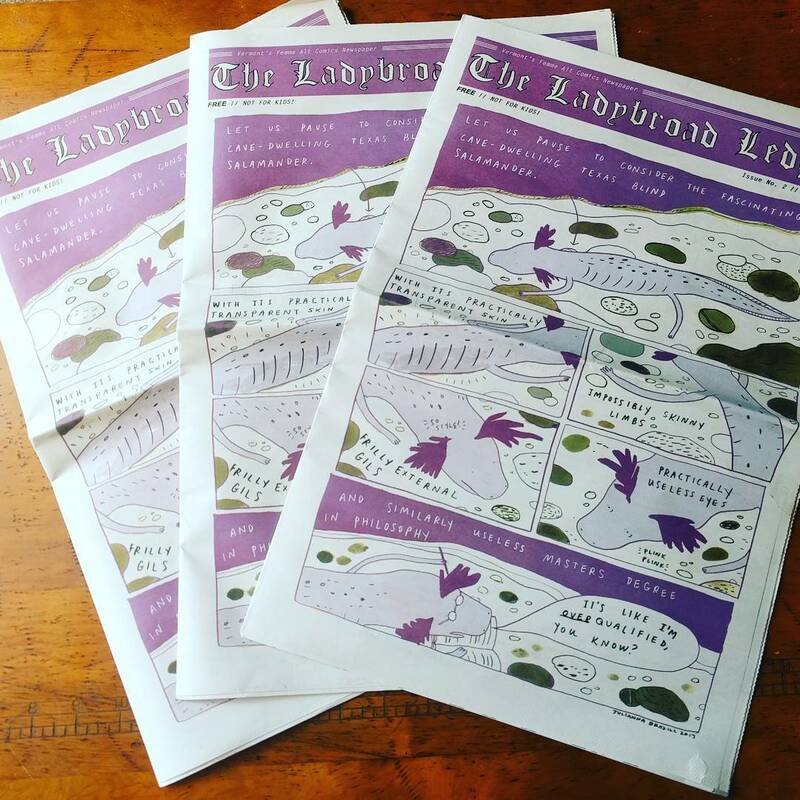 The Ladybroad Ledger is a group of female and nonbinary cartoonists from Vermont. Our goal is to produce a FREE twice annual newsprint publication to promote comics and comic art by femme Vermont cartoonists and distribute it throughout the state. Our FOURTH issue will be released in the summer of 2018. So far, we've printed and distributed 6,000 copies of our first three issues for free throughout the state and at comic conventions along the east coast. We've been featured in Seven Days, VPR, High-Low and on the CCS blog. We're using Patreon as a way to gather subscriptions from those who may not be able to pick up a physical copy of The Ladybroad Ledger, and for those who would like to donate to keep our newspaper running. Since we are a free publication, a basic subscription will only cover shipping costs (rounded up to the nearest dollar.) You will have the option to increase this amount to use as a donation. To receive a mailed copy of this issue, pledge by June 30th, 2018. You will not be charged until after that date. Please contact us at ladybroadledger[at]gmail[dot]com if you are interested in shipping over 25 copies. We can also deliver in-person to Burlington, White River Junction, Middlebury, and Montpelier. Donation only - This tier does not include a subscription for physical copies of The Ladybroad Ledger. You can increase the amount of your pledge on the checkout page. Subscription for a single issue of The Ladybroad Ledger. US only. Subscription for 5 issues of The Ladybroad Ledger. Share Ladybroad with your friends! US only. Subscription for 10 issues of The Ladybroad Ledger. Good option for small shops & libraries! US only. Subscription for 25 issues of The Ladybroad Ledger. Good option for shops & libraries! US only.